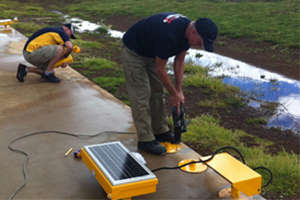 Avlite’s solar helipad perimeter and flood lights ensure easy, fast, low-cost installation and maintenance. 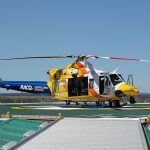 RACQ CareFlight Rescue – based in Toowoomba, Queensland provides community-based emergency rescue and patient transfer services 24/7 in and around the Southern Queensland region and has been doing so for 30 years. With around 80% of CareFlight’s 500 rescue missions departing their busy Toowoomba base annually, the need for enhanced safety measures for operations at night or in poor weather conditions was the obvious next step in the base’s site improvements. “The installation of Avlite’s ICAO compliant touchdown lift-off (TLOF) perimeter lights and accompanying flood lights was very easy…and took only 3 hours [to complete] with just two maintenance personnel,” offered Mr. Jimmy Cardoo – CareFlight’s Maintenance Facilities Manager. 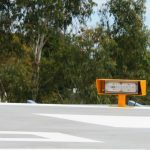 was quickly and easily installed onto the existing concrete helipad landing site (HLS) with minimal interruptions to its rescue operations as the light fixtures come straight out of the box, t-for-purpose with all the necessary components to ensure a no-fuss installation. The light fixtures were simply bolted to the existing concrete helipad via the fixtures frangible mounting plates. If a light fixture requires replacement or maintenance at any time, it can be removed or replaced without effecting the operation of the other installed lights which is a big plus for an emergency rescue service like CareFlight who cannot at any time afford limited access to their HLS. 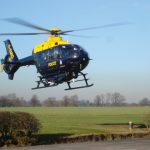 As a result of the enhancement to CareFlight’s HLS, pilots and crew feel more con dent when manoeuvring their machines over the neighbouring airstrip on approach to their landing site – especially at night. During a recent night mission, one of CareFlight’s duty pilots said before getting a visual of neighbouring air field lights he could see the new green helipad lights which were ‘quite impressive’ and important to rotary-wing pilots who often come in at oblique angles (unlike fixed-wing aircraft that line up with the runway, or into the circuit). 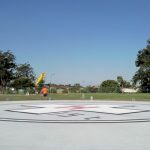 He also confirmed that in addition to the improvement of safety, pilots and crew can now locate the helipad quickly despite it being located amongst a lit runway and surrounding residential area concluding that ‘the new lighting certainly is a great asset to the Toowoomba base’. an operations perspective as it [also] enhances the safety during foggy conditions early in the morning, in late afternoon and evening and improves operations significantly. 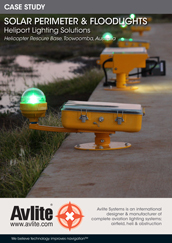 As the world’s only ICAO compliant solar-powered LED (TLOF) helipad light, Avlite’s helipad lighting fixture is wirelessly controlled and completely self-contained. 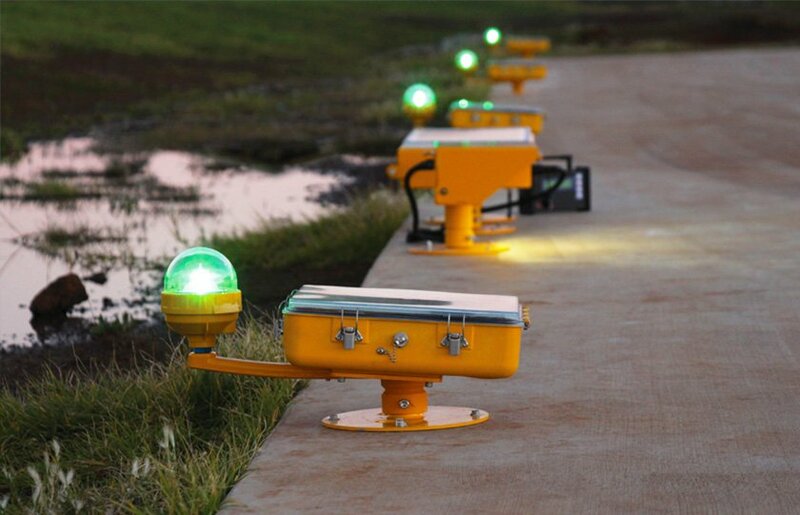 Each light gives over 50 hours of continuous operation at ICAO’s TLOF (touchdown lift-off) light intensities. It comes ready to install, straight from the box and is supplied with a frangible mount assembly and base that can be bolted directly into concrete, or via one of Avlite’s heavy duty rubber mounting tiles for extra portability. that allows operators to control the lights as required. Since flight operations at CareFlight’s base are not strictly ‘scheduled,’ meaning that the rescue helicopters come and go, lights are not required to remain active 24/7, so the remote controller enables the operator (pilot or ground crew) to switch lights on and program them to turn off or ‘time-out’ at a preset interval as needed.